A 1910 era armchair from a Milwaukee bank is completely restored. 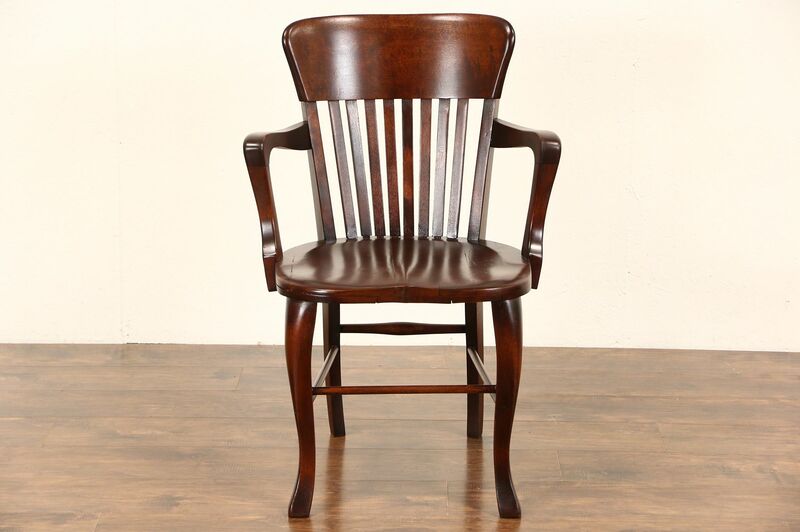 The excellent mahogany finish is gleaming on solid birch hardwood. The frame is tight and strong, shrinkage separations from age are reglued to serve another generation. A curved back and sculpted seatsare very comfortable on this rugged American made antique library or office furniture. Size is 24" wide, 23" deep, 35" tall and seats are 18" high and 17" deep. Matching chairs in photos are priced and sold separately, call or email for availability. See 12 photos on Harp Gallery website that enlarge to full screen size.